"Fattoush is one of the most well known Middle Eastern salads and a standard dish on the 'mezza' (small dishes) table. It's a colorful tossed salad with a lemony garlic dressing, and if you've never made a single Arabic dish, this is a delicious and healthy place to start." Heat vegetable oil in a large skillet over medium-high heat. Place pita pieces into the skillet without crowding. Fry in batches until golden brown and blot dry with paper towels. Combine cucumber, tomatoes, red onion, parsley, mint, olive oil, lemon juice, sumac, garlic, salt, and ground black pepper in a bowl. 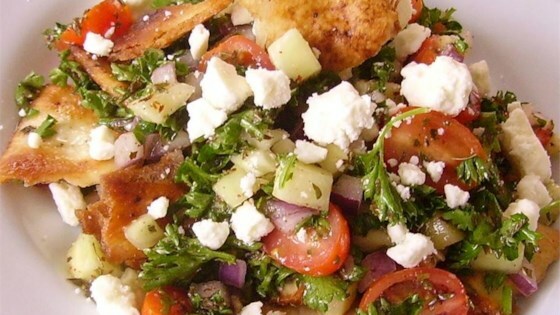 Gently toss salad with fried pita pieces. Grate feta cheese on top using a small cheese grater. Delicious salad. Added more garlic - I always order this at our local mediterranean restaurant so it was nice to have it at home too. I made this without the mint and pita chips and used curly parsley instead of Italian. Whenever I have had this in restaurants it also has curly parsley not Italian. Made per directions. Very light and tasty but still filling - pitas are excellent. forgot the feta but still delicious.